"Software expands to fill the space available" is an industry truism, and never has it been better evidenced than in Office 97 -- not (as they say on Seinfeld) that there's anything wrong with that. The latest version of Microsoft's popular application suite is no lightweight, weighing in at about 191 MB for a full install (121 MB for a typical installation). But these days, disk space is so cheap that there's no reason to mince features. 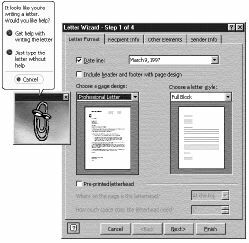 And through years of competition and evolution, our favorite applications have gotten pretty smart: Word 97 won't do your research for you, but it does just about everything else. The Office 97 Professional suite includes new versions of Word, Excel, PowerPoint, and Access, as well as an entirely new e-mail client and scheduler called Outlook. Another component, Bookshelf Basics, consists of an electronic dictionary, thesaurus, and book of quotations. Several other versions of Office 97 provide different combinations of applications at varying prices. Across the suite, the biggest differences are more "smart" features and more attention to the Internet. The computer illiterate will appreciate Office 97's enhanced help options. Throughout the suite, a feature called "Office Assistant" makes getting help simpler than ever. The Office Assistant is a character who responds to questions you type in plain English ("How do I use page numbers?") with helpful suggestions. There are a variety of characters to choose from: a dog, a paper clip, an Einstein look-alike, even Shakespeare and others. And the Office Assistant can even initiate help: type in "Dear Jim," and Einstein will pop up and help with preformatted letter templates. Office 97 is Internet savvy, as well. Type an e-mail or Web address in Word or Excel, and it goes live automatically -- just clicking on it will bring up the site in your browser. All programs also have a "save as HTML" option, making it easier than ever to create content for the Web. Additionally, a Web toolbar provides quick access to your favorite sites. Word 97 takes the world's most popular word processor to the next level. It features an on-the-fly grammar checker that actually works(!). Questionable phrases are underlined in green, and right clicking on the text brings up suggestions. And automatic versioning lets you save multiple versions of a paper within the same file. One caveat: Word 97 files are not compatible with earlier versions of Word, though the fix is easy -- just save as Word 6/95 or get the free update from Microsoft's Web site (http://www.microsoft.com/office/) which allows you to read the new files in older versions of Word. Another improvement that will be appreciated by the casual user is the new Outlook program. Outlook puts scheduling, e-mail, and more all in one place, and it does it far better than its predecessor, Schedule+. With a simple interface and powerful capabilities, Outlook should be a hit. One nice feature of Outlook's e-mail client is its preview mode, which lists the first few lines of a message along with the sender and subject, making it a breeze to sift through mail. The list of features and improvements in the new Office is too long to mention, but the overall effect is software that's simply easier to use, since it works the way you do. With a solid upgrade to an already great software suite, Microsoft should have no trouble expanding its already huge market share. Office is the software giant's most lucrative product, and the work that goes into development shows with every click. With all of its improvements, Office 97 is the suite to beat for now ... at least until Office 99 rolls around. Post-It notes, Ziploc bags, paper clips ... ever notice how all of the truly great inventions are the simple ones? Microsoft's IntelliMouse, released along with Office 97, can now join these ranks. The IntelliMouse looks exactly like the standard MS mouse, but with one key difference: between the two buttons lies a little roller wheel. Combined with new software, this allows you to scroll a window by simply turning the wheel, without having to move the mouse. Or click the wheel, and then move the mouse to have the window scroll. Currently, the mouse's wheel works only with Office 97, Internet Explorer, and a handful of others (as well as Windows Explorer), but the list should grow quickly. But be careful: the IntelliMouse feels so natural, you'll probably find yourself reaching for a non-existent wheel when using your friend's computer.